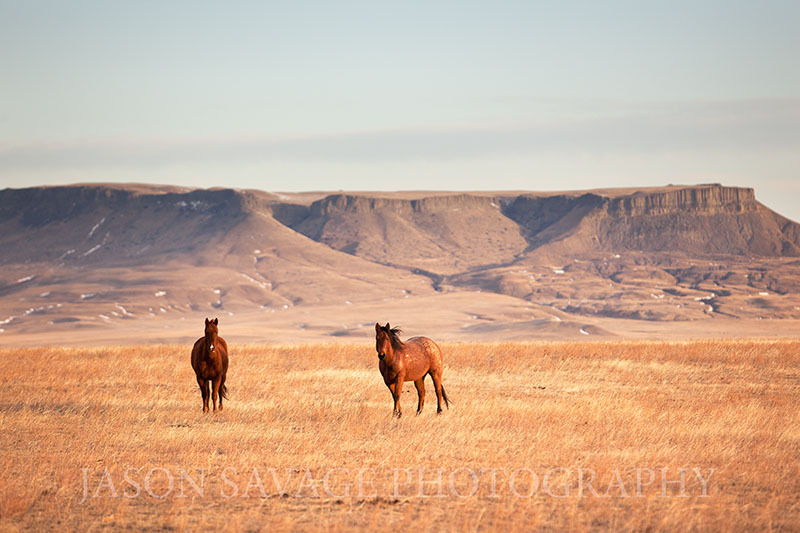 Horses near Square Butte, Montana. It was a beautiful morning yesterday near Square Butte, Montana. We finally had some sun(yay!!!) and some really nice morning light. The overcast days have taken a break and it’s been fantastic weather the last few. However the winds were sure howling up there with high wind warnings posted all along the Rocky Mountain Front and surrounding area. It was the fun type of wind that you can lean into and it will just about hold you up. Not good for keeping hats on though or setting up tripods! It was blowing so hard, that I wasn’t able to set up a tripod all day. However it was a nice break to shoot everything hand held and really had to improvise with leaning on fence posts all day and cranking up the ISO on my camera. Couldn’t beat it though. We were there on the 22nd. and climbed to the top and when over to the East rim for the view of Great Falls and area to the East. My son, grandson and I decided late in the afternoon to do this. I was on top many years ago and said that I would like to do it again some time, so we did. It was great, but the wind was something else.